What we learned from our first year of interviewing inspiring people. My wife and I are on a mission of spreading love, joy, and positive vibes across our community and across the globe through our website (www.tolivefor.org), associated social media platforms, and by producing live, inspiring shows with story tellers, musicians. We have been blessed to meet people from all over the world during our first year on this venture and adventure. Their stories and talents are inspiring, and we believe that sharing their stories and gifts will inspire more people to share their positive vibes. The result is wave after wave of positive vibes and joy that we hope will bring healing to our communities and to our sacred earth. One of the most exciting forums of our work is taking the time to meet and interview people who are living life with zest and joy. 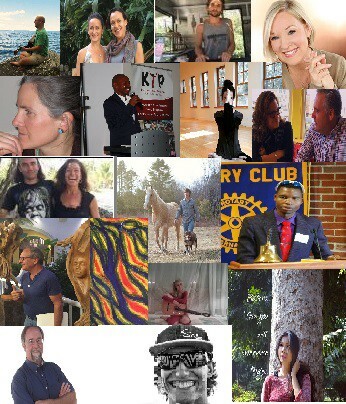 Whether it is the singer from Sweden, the Costa Rican juice maker, the Californian yogi, South African CNN Hero finalist, video creator from India, local musician, or roving artist, or any one of our first 50 interviewees, the poignant and inspirational messages they share all have common values and beginnings. It is obvious when you watch these interviews or meet these people who are leading a life to live for, that they are full of joy and love for life so it’s only natural to ask how they got to this point or how they chose this path. When asked at what point in life did they know their deepest passions or gifts, almost every interviewee stated they knew early on, usually as a young child, what made their heart burst with joy and fulfillment, and what they really wanted to do, or be, or create when they got older. Despite knowing as a young child what resided within their heart in terms of special gifts and talents, almost every interviewee did not pursue these gifts as a vocation or on a regular basis. Instead, they usually opted for traditional educational and career paths because this is what was expected of them culturally or familiarly. It was usually not until their adult life did our inspiring subjects come back to connecting with their deepest desires and passions that they had known about as a child, and often it was because there was some type of life event that made the person redirect, redefine, or rediscover their purpose or path. It’s probably not a surprise, but everyone speaks to the fact that their journey has not been easy. There have often been significant turmoil and challenges, and there have been times of self doubt and questioning. The response in overcoming these challenges is nearly unanimous as well: DO NOT GIVE UP PURSUING YOUR DREAM. A lot of our To Live For guests spoke about a ‘knowing’ that resided deep within, and that they usually had to make a conscious decision to connect with this knowing, to delve deep into this knowing to better understand it, and to trust this inner feeling. Believing in this ‘knowing’ was often the biggest challenge because this meant casting away the self doubts and fears that had accumulated over time. It is believing and following this ‘knowing’ that is key in learning to do what brings us the most happiness. Now, we certainly don’t have to wait for some major life event to walk the path less traveled or go back to how or what we really want to be, so that leads to the question we asked a lot of our story tellers, “How do you recommend someone get in touch with their deepest gifts, desires, or passions? The answer is, again, almost unanimous: Take time every day to be still. Whether it is for 5 minutes or 5 hours, being still and listening to your self is crucial in finding the direction you want to walk your path. Nearly as prevalent a response was stating that time each day in nature was critical to finding the path our interviewees wanted to walk. It seems a common message is that nature is full of the energy, guidance, and support that helps one become more aligned with what we are identifying as our deep passion or gift. When I look back at our initial group of interviews, I realized that, again, nearly everyone spoke of feeling very blessed and thankful for the gifts they have been able to share and the path that they have traveled, even though it has been extraordinarily challenging at times. Gratitude, indeed, was a common quality among these inspiring people. Based on our interviews and the wisdom of Mr. Kimura, I think we’re onto something. The more we live in and share our positive vibes, the more laughter and happiness there will be, the stronger our sense of belonging will get, and the longer we will live. Now, that’s to live for! If you would like to share your inspirational story or your gifts, please visit the contact page of our website: http://tolivefor.org/contact/.